Wenden is located between the two county cities Olpe and Siegen belonging to the county of Olpe. 15 min away from Olpe City and 20 min away from Siegen city it lays at the southernmost tip of the Sauerland, an area of low mountain ranges 5 min away from the triangle of the Autobahn A45 and A4. Both, Olpe and Siegen are connected right to the Autobahn A45 between Frankfurt and Dortmund where Wenden additionally is connected to the Autobahn A4 to Cologne. The transfer time to Frankfurt or Cologne is about 60-120 minutes each by road or train. 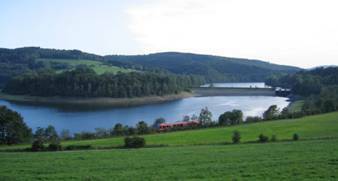 City of Wenden: Lake Bigge (Biggesee) Within a few minutes range you can find one of Germany`s larger artificial lakes and freshwater reservoirs. Over the years, the Lake Bigge with it`s 8.7 km² surface became a tourist magnet. Apart from the possibilities for water sports (sailing, surfing, rowing, canoeing, fishing and diving), there are numerous cycle and hiking routes round the lake and its environs. The Bigge Dam belongs to The Industrial Heritage Trail adapting 17.6 MW Hydropower. Even you can cruise on Lake Bigge but unfortunately only from April to October. 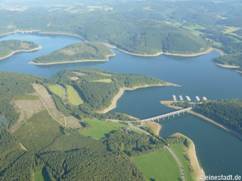 Within a few minutes range you can find one of Germany`s larger artificial lakes and freshwater reservoirs. Over the years, the Lake Bigge with it`s 8.7 km² surface became a tourist magnet. Apart from the possibilities for water sports (sailing, surfing, rowing, canoeing, fishing and diving), there are numerous cycle and hiking routes round the lake and its environs. The Bigge Dam belongs to The Industrial Heritage Trail adapting 17.6 MW Hydropower. Even you can cruise on Lake Bigge but unfortunately only from April to October. The entire region is a former and today’s center of heavy industry, high tech and education and at the same time an important area of natural resources water and forest of Germany. It covers fascinating countryside in which wooded mountains and hills alternate with idyllic valley meadows, traversed with crystal-clear streams and rivers. This variation is characteristic for the special scenery and offers many possibilities to escape from the hustle and bustle of everyday life. Deep forests, gently spreading hills and valleys, lush meadows and romantic little villages with timber-frame houses – this Heartland of Germany has everything on offer for hikers, Nordic walkers, strollers and fresh-air fanatics.